Will you look at that? It's May already and we're in the final countdown for delivery of Boss Monster to your eager and -- let's admit it -- extraordinarily patient hands. It's been a while since we checked in, but we haven't been slacking. 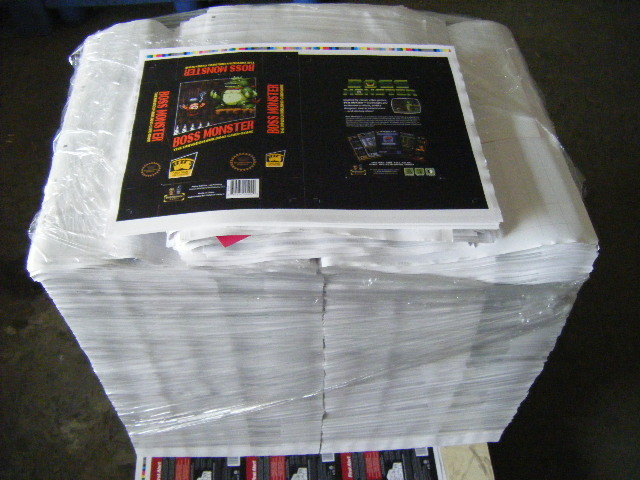 Since our last update, Boss Monster has moved from pre-production to production to packing and shipping prep. This past month has been filled with constant back-and-forth communication with our printing partner, Panda Game Manufacturing. That's meant long hours spent peering suspiciously at game files, making sure everything is perfect. At the same time, we've been getting everything ready with our shipping and fulfillment partners, prepping them for the mighty task of getting Boss Monster to you. During this time, we've had the pleasure of watching Boss Monster come together. 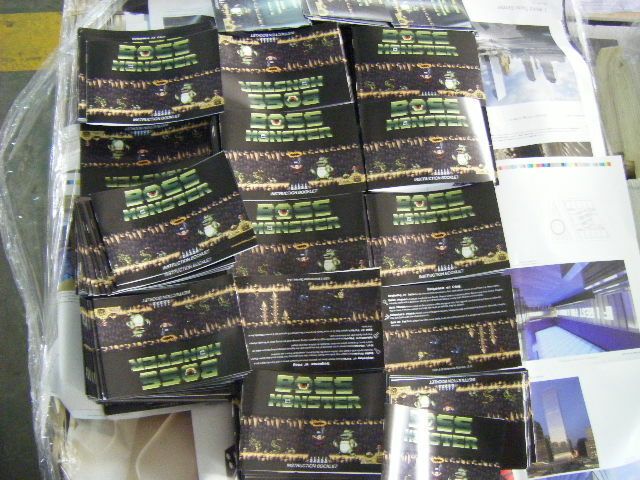 Here are some of the photos we've received from the factory floor, revealing the final box art and instruction manual. We can't tell you how neat it has been to watch the game come to life. There have definitely been moments where the work of Boss Monster was daunting, and there's no question we underestimated some of the challenges of being an independent game publisher. It's been worth it, though, and the pride we have in this game is only exceeded by the gratitude we feel toward all of you for making it possible. What's Going to Happen in the Next Month? 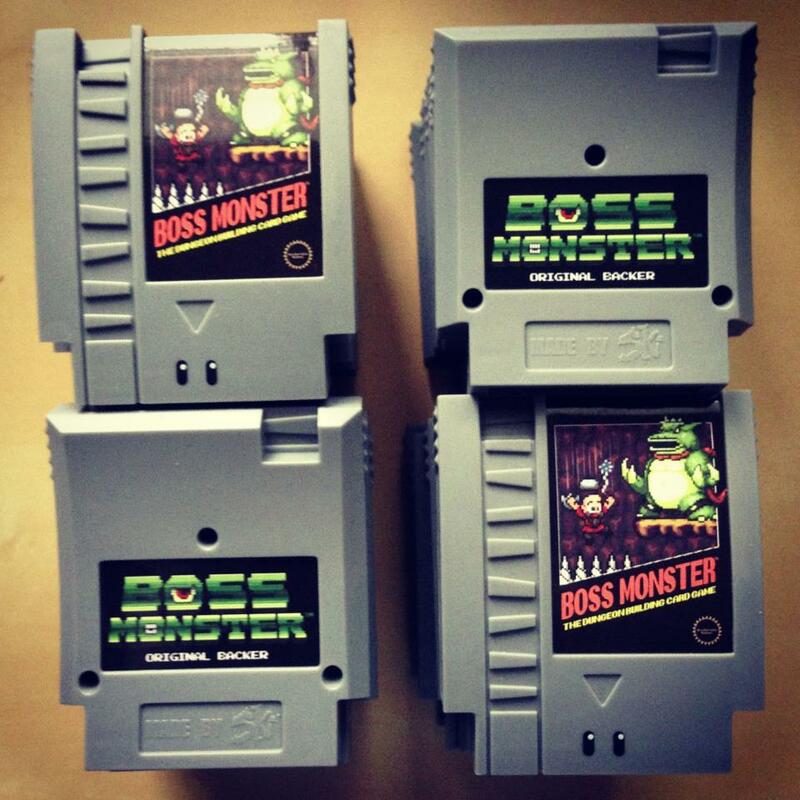 Boss Monster is in the final stages of packaging and shipping preparation. Any day now, it will be whisked off to the docks to make its way to our fulfillment warehouse in Los Angeles. Our shipping company has promised us as speedy a transit as is possible, and we're still hoping that Boss Monster will make landfall in the U.S. at the tail end of this month. There is every possibility that shipping slowdowns will occur and we'll push into the first couple of weeks of June, but we promise we're doing everything we can to keep things moving quickly. If rowing the boat would make it go faster, we'd buy some oars and catch a plane to Hong Kong. While our first priority is delivering to backers, we've also been talking to distributors (Diamond-Alliance, Southern Hobby, ACD and PHD) who work in the "hobby games" market. These are the companies that supply your friendly local gaming store with products, and Boss Monster will have a place in all of their catalogs. Response has been very positive, but individual game store owners are the ones who decide to try out a new game. If you know someone who owns a game store, let them know to be on the lookout for Boss Monsters! They can check out a solicitation for it in issue #160 of Game Trade Magazine (which should come out in June). Our goal is to make sure Boss Monster has a strong presence in hobby and game stores, so you'll always have a place to find new opponents. Speaking of pushing Boss Monster, it's time to start showing your Boss Monster pride (digitally, at least). You can download a bevy of Boss Monster wallpapers (in a variety of dimensions) here. Of the various alternate pledge rewards we offered (the strategy guide, prototypes, T-shirts), most have already made their way to backers. However, as the actual game makes its way overseas, we still have two important rewards left to fulfill. This week we've started shipping the long-awaited 10-Doh figurines, and they're looking great. Here's a stack of gray cartridge figures without their arms and legs attached. For more photos, keep an eye on our Facebook page and forums later this week. For the select few of you who sponsored a Boss with the "One-of-a-Kind" pledge levels, Boss Monster artist Katrina Guillermo has created some great artwork cards and is in the process of signing the Boss cards. We'll be shipping those framed cards this month as well. We will check back in at least once more before the game ships, so you'll know exactly when to start checking your mailboxes. Thanks to all of you for your support, patience, and general awesomeness. We can't wait to get this game in your hands! For those of you who have moved since November and haven't yet updated your address with us, please take the time now to send us an updated address to bwisegames@gmail.com.